Whatever your style or budget, you’ll find the perfect easy care flooring for the way you live at Performer’s Flooring & Design Gallery. We know how important furry family members are, and to accommodate you (and them!) we carry thousands of pet-friendly flooring products to choose from including carpet, tile, resilient, and sealed flooring. Our conveniently located flooring showroom serves the greater Chicago-land area, as we are centrally located two blocks west of Gary Avenue in Bloomingdale. Our experienced flooring sales professionals have considerable experience with every flooring type that we carry. In fact, combined our sales team has over 100 years of experience in the flooring industry! We are happy to assist you in finding something to fit your needs and budget. We want to help you find the look that you want without the massive price tag! While we love our pets- and know you do too- we also know that they can be especially tough on certain types of floors. Pets nails can easily scratch a laminate or hardwood floor. And, while pets often enjoy the softness that carpet provides, occasional accidents can wreak havoc on these types of floors. But with our knowledge and premium floor covering options, pet stains, scratches, and scuffs can be a thing of the past. If you’re unsure of where you should start your search for a new floor, we are here to help you turn your flooring dreams into a reality. We’ll ask you a few questions about the rooms in your home that need new floors and the look that you are trying to achieve, and then based on your unique lifestyle, we can suggest the best floor covering for your space. We are proud to carry the area’s most diverse selection of stain-resistant carpet. One of our flooring consultants can help you pick out the flooring of your dreams at prices that you'll have to see to believe. Once you find the perfect stain-resistant carpet for your space, our experienced in-home installation specialists will be there to make sure your carpet installation surpasses even your highest expectations! Tile floors speak volumes about your personal style. Tile is an easy-care flooring option that can easily blend with any existing color palette. In addition to making a bold design statement, dark tiles can hide dirt in a home with pets or children. Darker grout is a popular option with darker colored tiles that lends a clean, uniform look to any space. Tile flooring is nearly hassle-free when it comes to pets. 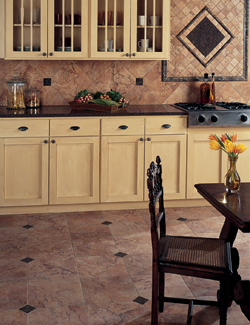 Glazed tile offers a hard surface that won’t break, scratch, or stain. This virtually maintenance-free flooring option is also simple to clean and keep sanitary. At Performers Flooring & Design Gallery, we carry top-rated brands and exclusive easy care flooring styles from industry-leading manufacturers. Our resilient flooring styles mimic the look of high-end flooring and are available at a more affordable price point. From nature-inspired designs to the warm beauty of wood, resilient flooring is more popular than ever! Many customers struggle when trying to find pet-friendly flooring that fits both their lifestyle and their design vision. Today’s resilient flooring merges the beauty of natural materials with modern technology to create durable looks inspired by nature. With an impressive selection of finishes and textures, resilient flooring is a fashionable and affordable choice. Sealing creates a protective layer to strengthen a floor’s defenses against spills, dirt, and erosion. Sealed flooring is a nearly problem-free option when it comes to pets. It provides a hard surface that won’t crack, stain, or scratch and is remarkably simple to clean and sanitize. Our impressive collection of pet-friendly flooring products makes it easy for you to get the style and durability that you want at a price you can afford. Contact us today to learn more! Contact us today for pet friendly flooring that will meet your needs. We proudly serve the Greater Chicagoland area and the surrounding areas.